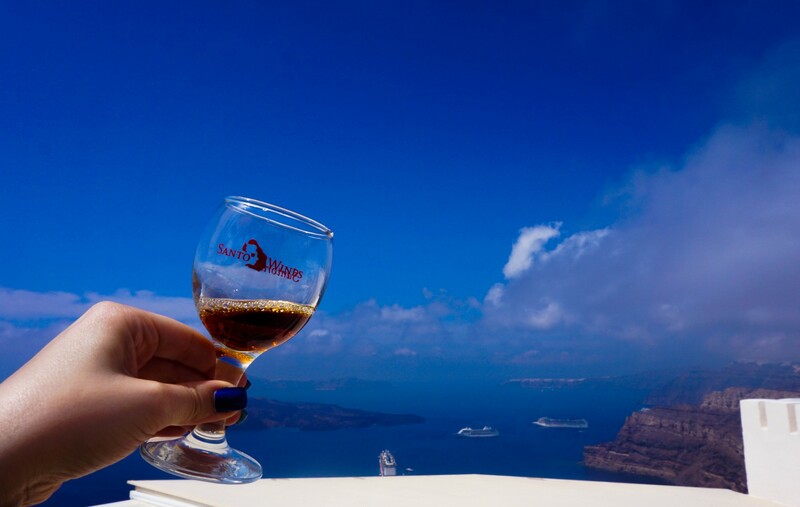 Sparkling Santorini: To Cruise or Not To Cruise? Written by Kim on November 15, 2015. The gleaming Greek Island known for its white churches with blue domes and out-of-this-world sunsets has topped my bucket list for quite some time. It’s an endlessly romantic place. Oh, to bask in the Santorini sunshine while longing in an infinity pool overlooking the caldera and tiny sailboats dotted across the sprawling Mediterranean. It’s the picture of perfection. And it’s an ever-popular spot to flock to for your European holiday. Believe me, I spent hours researching every possible way to maximize that two-week vacation. In the end, we opted for the Greek sampler—a cruise with one day spent on each of several islands. That way, we could visit many places in a short amount of time, and could see where we’d like to spend more time someday. 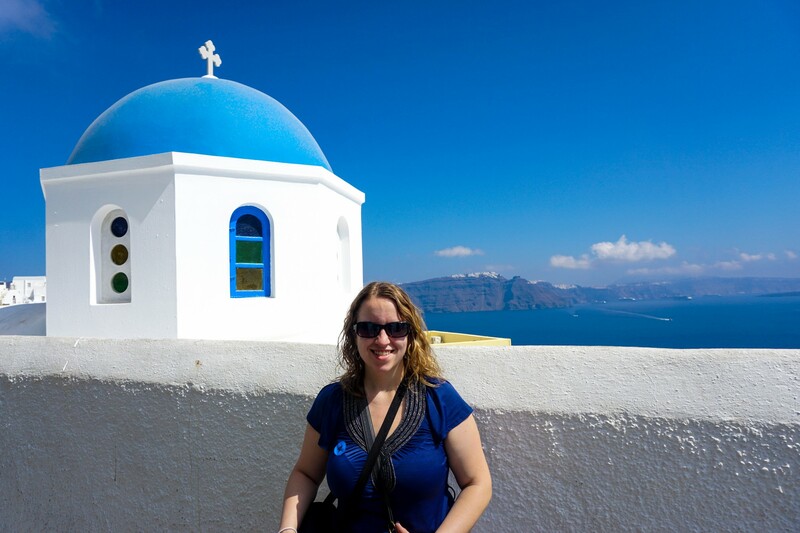 Big surprise—I want to go back to Santorini already! Our cruise aboard the Celebrity Reflection was an 11-night journey, round-trip from Rome. Our original itinerary included Santorini, Mykonos and Athens, but after canceling a call on Istanbul, the islands of Crete and Rhodes were added to fill the extra days. So we got to see a surprising amount of Greece—but still, I wish we’d had more time in Santorini. Here’s what I recommend for cruisers—and what I would do differently if I were staying there. 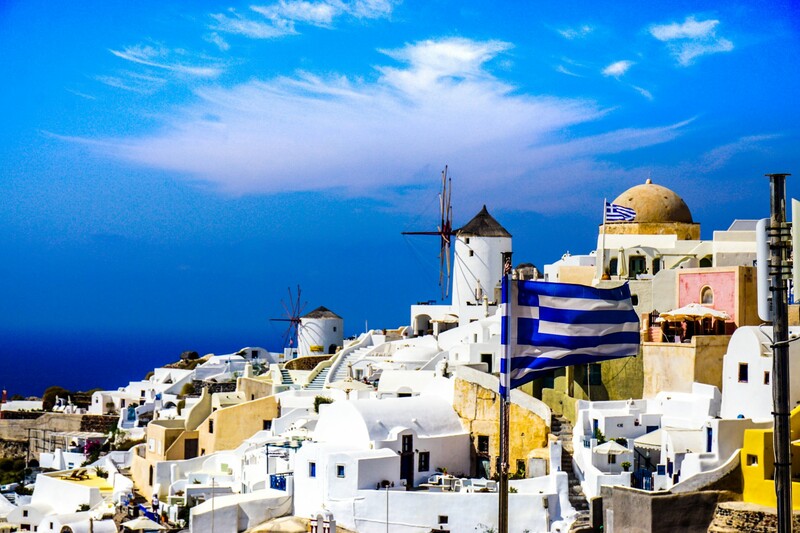 Shore Excursion = Extra time on Santorini? To call on Santorini, cruise ships need to tender (put the anchor down away from a dock, and bring people to shore aboard smaller boats). We were not planning to buy a shore excursion for Santorini, but on our particular cruise, we found out that the ship would make a stop at a dock so people who purchased excursions could board buses, and those without excursions would have to remain aboard until the ship moved on to its resting spot for the day. 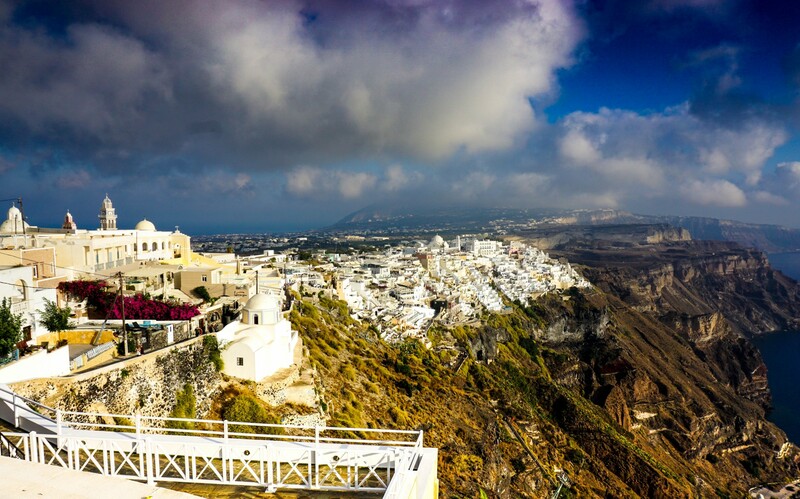 In the interest of having as much time on the island as possible, we purchased an excursion that included a stop at a winery, some time in the town I desperately wanted to see—Oia—and dinner in Fira. 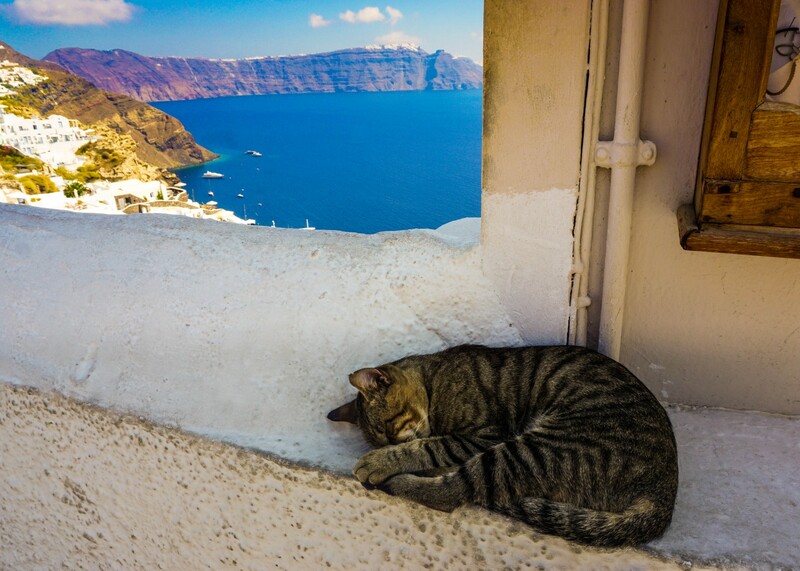 Ask the shore excursion desk if that’s the case if you want to cruise to Santorini. I am certainly glad we booked the excursion, since I’m not sure how we would have managed to cover so much ground in such a short amount of time. We arrived at 2 p.m., and our ship was to sail away at 10 p.m. We heard from people who rented cars and had a great time, but for us, it was just easier to hop on the bus. Santo Wines: Good wine, great view! I was less than enthused about visiting Santo Wines at first, but once I saw the view, I was completely and utterly in love! And the wines were pretty darn good, too! 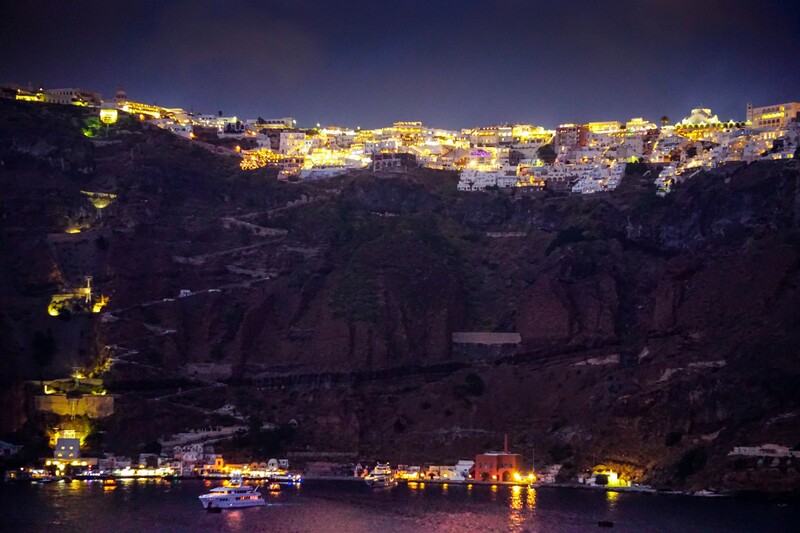 Go to Oia and Just Stay Forever! From there, we drove to Oia (pronounced ee-ya), the most charming of the towns on Santorini. This drive took about half an hour, which really surprised me. You don’t necessarily think of Greek islands as having lots of ground to cover—or at least I didn’t—but that was another reason I was glad we booked the bus tour. In Santorini, all towns on the island are high above sea level, but Oia faces west and is known around the world for its spectacular sunsets. People gather by the droves to sit on any available wall to watch the sun sink into the water as the sky comes alive in vibrant shades of oranges and reds. Naturally, though, our visit was late-afternoon, and we only had a little over an hour to spend there. We managed to snap a few pictures of the churches and walk up to the ruins of a Byzantine castle—which I imagine would by an idyllic place to watch one of those famed sunsets. Then it was time to power-shop and head back to the bus. If I were camping out on Santorini for a few days, though, this is where I’d pitch my tent—or rent my luxury resort. If you’re planning a trip to Santorini, trust me, stay here. You won’t be disappointed. Fantastic Baklava, but Holy Cable Car Line! Our last stop was in Fira, what is known as the “main” town of Santorini, presumably because its cable car takes literally thousands of cruise ship passengers to and from the island each day. 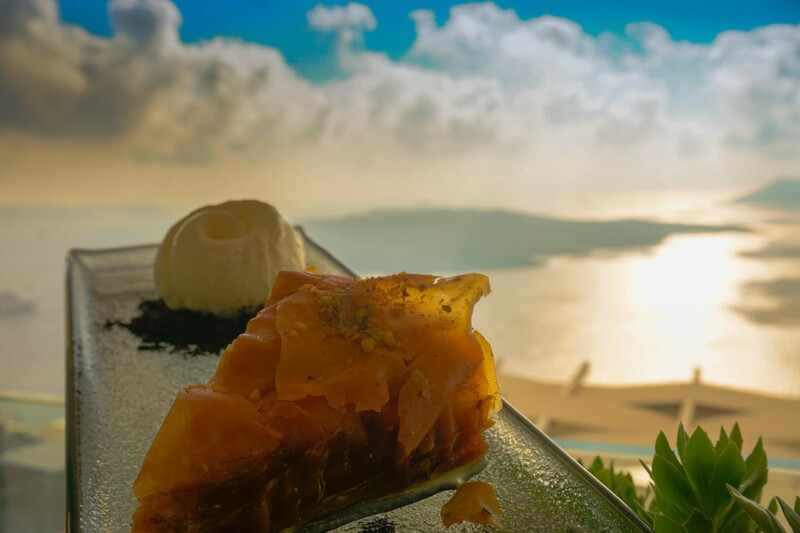 Kyle and I enjoyed a piece of Baklava here, looking out over the caldera and our cruise ship. We figured if we waited around, we might be able to catch a glimpse of the sunset from here. We took a lovely stroll, and continued to shop before we realized that the line for the cable car was absolutely enormous! It was about 8 p.m., and we knew that if we waited any longer to get in line, we might not make it back to the ship in time. (Don’t listen to the guide who tells you to jump in line around 9:30, and you should be fine. We so would have been trying to figure out how to catch the next ferry to Mykonos!) When we checked the line around 7-7:30 p.m., it was almost non-existent, so we walked around a bit more. And all of a sudden, it grew out of nowhere. If you have to get off the island at night, go down earlier rather than later, and try to watch the sunset from the top deck of the ship. So, there we stood for the last 90 minutes of our time on the island—and I imagine people stand there longer most nights. There was only one other ship in port with us that day. I can’t imagine how long that line would be with 4-5 ships’ worth of passengers. Let’s just say, it’s not exactly the way I’d like to cap off a beautiful day in one of the most romantic places on earth. Just do yourself a favor and don’t be standing shoulder-to-shoulder with thousands of your new closest friends as the sun sets on the other side of the island. Standing in line, missing our Santorini sunset, Kyle and I started plotting our return, and how differently we’d do things next time. Santorini was the only stop on our cruise that left me wanting so much more. I am glad we did the Greek island “sampler,” if for no other reason than to know that Santorini is pure magic, and that it can’t be appreciated in a few hours, let alone a few days. I mean, just look at this place! And so, Santorini remains at the top of my bucket list.